A dispute over efforts to strengthen the legal rights of minority religions has opened a new fault line in Georgia’s fractured political landscape. It is also helping to define the limits of the governing United National Movement’s influence. Civil code amendments, passed on July 5, will allow “those faiths that are considered legal religions by member countries of the European Council” to register as full-fledged religious organizations. Previously, such groups were only able to register as charities or non-government organizations. The changes, which have been praised by the international community, sparked outrage among Georgian Orthodox Church faithful, many of whom see them as an attempt to undermine the Church’s special role in society, a position facilitated by funding from the state budget and tax breaks. During an early July protest, hundreds of Georgian Orthodox believers and priests marched through downtown Tbilisi, carrying Georgian icons and flags, to the city’s main Sameba (Holy Trinity) Cathedral. The protest, one of the largest – and most colorful – in recent memory, offered a powerful reminder of the popular strength of the Georgian Orthodox Church. 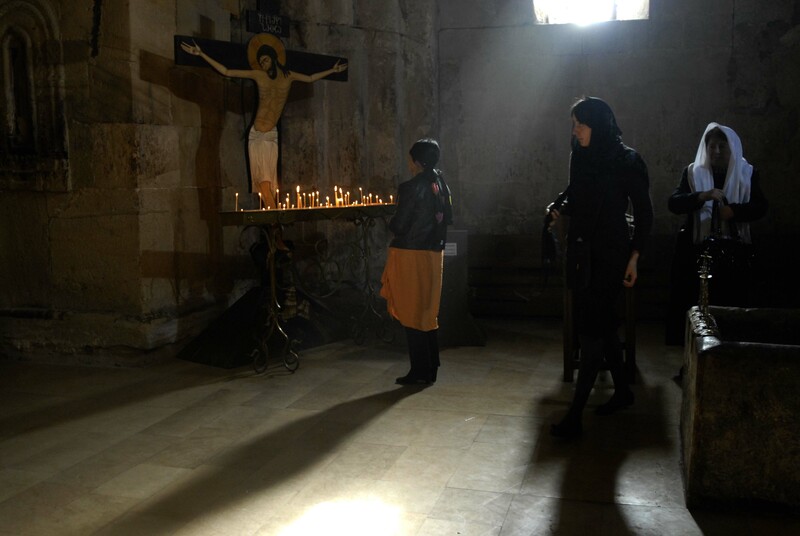 At the core of Church supporters’ opposition is a concern that the law will make it possible for the Armenian Apostolic Church to contest the ownership of scores of churches. A wave of anti-Armenian sentiment has bubbled to the surface in TV talk shows, blogs and Facebook discussions on the amendments. Much of the heated rhetoric started to subside on July 12 after a meeting of the Church’s Holy Synod, which called for calm. At the same time, the synod urged parliament in the future to discuss with the Patriarchate draft legislation related to religion so as “to avoid any possible complications.” President Mikheil Saakashvili attended a liturgy conducted by Patriarch Ilia II at Svetitskhoveli Cathedral the following day, providing a visual reminder that tension had eased. The speed of the vote on the amendments – after just a few days of parliamentary debate – and the vote’s timing --- on the heels of a publicized trip to Tbilisi by the head of the Armenian Apostolic Church, Catholicos Garegin II – helped fuel tension, noted Giorgi Khutsishvili, director of the International Center on Conflict and Negotiation. The lack of extensive preliminary discussions with Patriarch Ilia II -- a man generally seen as the most revered public figure in Georgia – created an appearance that the governing party was “arrogant,” Khutsishvili said. The 78-year-old patriarch had requested that the final vote be delayed until a full discussion with the Church could be held. “I think that lots of things in Georgia are politicized which are not really political. And sometimes some actions of the government contribute to politicizing the issues,” Khutsishvili said. United National Movement MP Davit Darchiashvili, who supported the amendments, told EurasiaNet.org that the changes had been under discussion for “a long time.” [Editor’s note: Darchiashvili formerly served as executive director of the Open Society Assistance Foundation – Georgia, part of the Soros Foundations network. EurasiaNet.org operates under the auspices of the Open Society Institute, a separate part of the Soros network]. The Georgian Orthodox Church, though, functions as more than just a religious institution; its privileged position and growing popularity has made it a “political actor,” said Marine Chitashvili, the director of Tbilisi State University’s Center for Social Sciences. “[Patriarch Ilia II] is still an authority. … He has no authority de jure, but, de facto, he has a huge authority,” Chitashvili said. Chitashvili described the resurgence of nationalism amid the debate over the status of minority religions as “artificial,” a phenomenon brought on by people’s shock that the decision was made so quickly, and not based on any real animosity between Georgians and Armenians. Even so, efforts by the Armenian minority in Georgia to broaden their cultural rights have rankled officials in Tbilisi. The Georgian and Armenian governments also went through a bout of tension in 2009, when two Georgian-Armenian community activists faced espionage allegations. The two countries have the world’s oldest (Armenia) and third oldest (Georgia) organized churches, and signs of a cultural rivalry are evident. Molly Corso is a freelance reporter based in Tbilisi.